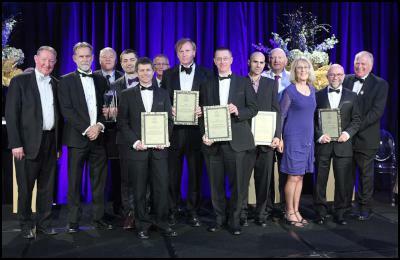 Fourteen winners took home highly coveted awards at last night’s New Zealand Engineering Excellence Awards, held at the Pullman Hotel in Auckland. The Awards, running since 2005, celebrate outstanding leadership, innovation, and excellence in engineering projects, people and practice. “It was a great night with such a high calibre of entries. It reminded us again just how well New Zealand’s engineering community deserves its world-leading reputation. The judges certainly had their work cut out for them,” Kieran Devine, interim Chief Executive of IPENZ, says. IPENZ is one of eight partner organisations hosting the awards. The 14 winners were selected from a pool of 53 entries, covering everything from earthquake-resistant building design, sewerage, waste and water management, through to electricity supply and safety. There were some excellent examples blending engineering design with New Zealand’s cultural heritage. “These are New Zealand’s premier engineering awards,” Panel Judge, Peter Higgs, says. The overall supreme award was given to the team behind the creation of Whangarei’s Te Matau ā Pohe bridge – which is only New Zealand’s second-ever bridge, and the first in 50 years, with a lifting mid-section to enable boats to pass underneath it. The design of the bridge incorporates the traditional Māori fish hook and takes its name from Wiremu Pohe, the Māori chief who greeted the first ever Europeans to visit the region. “It was a pleasure to announce McConnell Dowell Constructors Ltd, Transfield Services, Novare Design Ltd, Gaia Engineers Ltd, Knight Architects, Eadon Consulting, Northern Civil Consulting and Whangarei District Council as the joint winners of the Supreme Award for their work on Te Mata ā Pohe. It’s a well-deserved accolade that we hope will also inspire others to continue to integrate excellence in design with New Zealand’s unique cultural identity and ingenuity,” Mr Higgs says.